If you interested in filing for bankruptcy, start here for a quote of attorney’s fees! As a San Francisco Bankruptcy Attorney, Keith F. Carr charges affordable, low cost bankruptcy fees. Because of this, low cost Bankruptcy attorneys make filing for bankruptcy possible and convenient. Attorney Keith F. Carr has a 5-star Yelp rating. Attorney Keith F. Carr charges an affordable fixed fee for Chapter 7 when compared to other lawyers who charge a substantial premium fixed fee, $2,500 to $3,000 for even a simple Chapter 7 case. In fact, Attorney Keith F. Carr charges only a fraction of this premium fixed fee that other lawyers charge for a simple Chapter 7 case. For instance, SFgate.com summarizes the high fees charged by other lawyers for Chapter 7 Bankruptcy cases. When you complete the Bankruptcy Evaluation Form, your Bankruptcy Evaluation will include a quote of attorneys fees in your case. Your actual attorneys fees will depend on the complexity of your case and your financial situation. Payment plans are available. Attorney Keith F. Carr prepares and guides clients through the entire process without shortcuts. The Chapter 7 fixed fee includes full representation in Chapter 7. Full representation includes preparation of the Chapter 7 petition. In addition, full representation involves legal counseling on all matters in the Chapter 7 Bankruptcy. In addition, attorney Keith F. Carr will appear with the client at the Meeting of Creditors. Repayment of your creditors may be straining your income from employment. For instance, the monthly payments on your credit card debts (usually covering interest only) may require you to devote a significant portion of your paycheck. As a result, this could amount to thousands of dollars each month. Furthermore, you may have unexpected medical bills which make it impossible to cover your monthly credit card or car loan payments. You may have ever increasing payday loans, which prevent you from meeting the required monthly payments. Your wages are about to be garnished. In addition to the fixed fee for Chapter 7 Bankruptcy, debtor is responsible for the Bankruptcy Court’s filing fee for Chapter 7, which is $335.00. For Chapter 13, the Court filing fee is $310.00. Further, there are other costs for your Chapter 7 Bankruptcy that you must consider:Learn more about other costs of Chapter 7 Bankruptcy. The Law Offices of Keith F. Carr can handle your emergency bankruptcy filing to stop immediate collection action by your creditors. Therefore, an emergency bankruptcy filing can stop foreclosure of your home or garnishment of your wages. 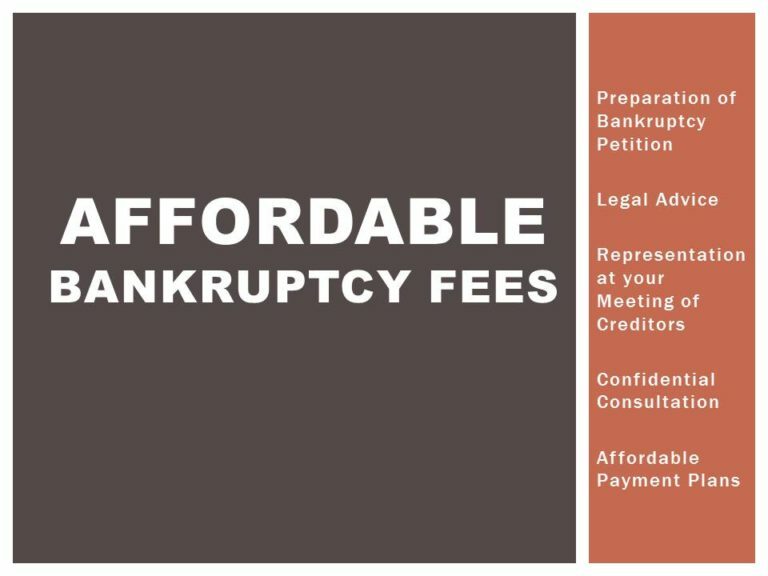 To summarize, the Law Offices of Keith F. Carr charges low cost, affordable fees for full representation in bankruptcy. The total attorney’s fee is determined by the complexity of the case and the circumstances of the individual debtor. There are other costs involved. Attorney Keith F. Carr can handle emergency bankruptcy filings. While there is no requirement to hire an attorney for Bankruptcy, learn if you need a Bankruptcy attorney: Do you need an Attorney for Bankruptcy?